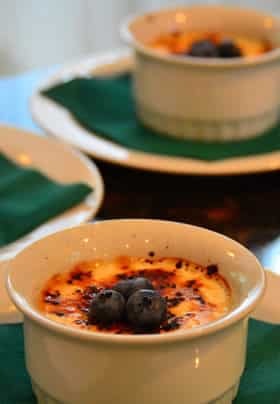 To round out your upscale boutique experience, a gourmet three-course breakfast will be served at 9:00 a.m. daily, focusing on local ingredients, both seasonal and artisanal. Breakfast includes fresh-baked goods such as muffins, scones or fruit bread with homemade preserves, followed by homemade granola, fresh fruit and yogurt. 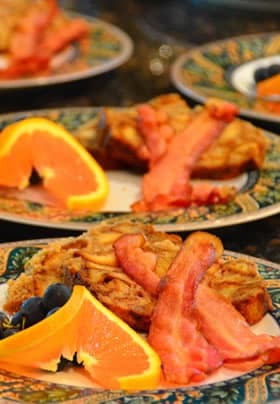 A hot option is offered for your third course: perhaps a bacon gruyere ham strata, vegetable frittata, waffles with banana foster or perhaps chai spiced French toast, and of course a side of bacon or sausage and potatoes. Coffee, tea and juice are always included with breakfast! Start your day inspired by a different coffee or tea from around the globe! Fair Trade coffee and tea are offered daily from different regions, and the coffee is fresh ground each morning. NOTE: We are happy to make every effort to accommodate special dietary needs; simply notify us when you make your reservation.